Q: Why is the site password-protected? A: To block detailed indexing by web spiders. We are still updating the programs, and also believe that this gives an extra layer of privacy to the site. The username is "solute" and password is "solver" (entered without quotes). Q: Who wrote the Solute-Solver program? A: The code was written by a nephrologist, Dr. John Daugirdas, with the help of Dr. Tom Depner, Dr. Tom Greene, and Paul Silisteanu. The paper describing the program was published in the November 2009 issue of the American Journal of Kidney Diseases, and is available (open access) here. A: The main program is complicated because it has a lot of features, and is designed to be useable by both U.S. nephrologists, who use English units of measurement and nephrologists in countries using SI units. It also can handle hemodiafiltration. A simpler version is Solute-Solver "LITE". It is suggested that you start there. 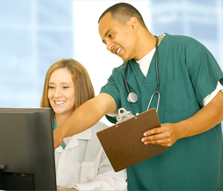 Copy and paste in one of the sample input strings, and then modify it before pressing submit to reflect your particular patient. 2016/09/02 What If? Module added. © 2009 Ureakinetics.org. All rights reserved.